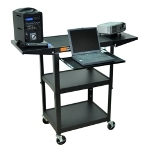 Computer carts are built for mobile computer applications, can be used with projectors, flat screen TVs, laptops, audio visual equipment or keyboards with other computer devices. 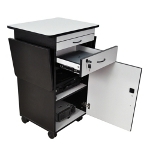 Computer carts can easily take a small space of room and change it into an office workstation. 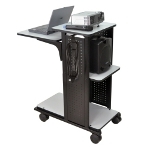 Computer carts on wheels allows you to effortlessly move the small computer cart from room to room, enabling to share the resources of the cart between classrooms or departments. 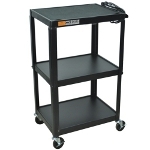 The carts glide on four rolling casters, and securely lock into place with locking brakes. 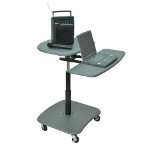 Mobile computer cart boasts four gray laminate work surfaces for all your AV equipment. Steel frame with black powdercoat paint finish. Adjustable height from 24" to 42" in 2" increments. Roll formed shelves with powder coat paint finish in black. Height adjusts from 24" to 42" inches in 2" increments. Cable pass through holes makes for easy wire management. 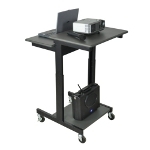 Laptop cart adjusts in height from 39" - 45". Serves as either as a stand-up or seated workstation for laptops or desktop computers. Height adjusts from 29" to 36". Pull-out shelf for a keyboard or projector and a lower shelf that fits your printer or other equipment.